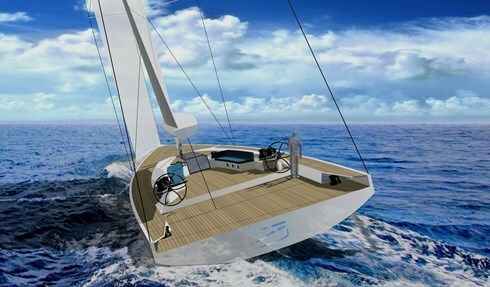 In September 2010 during Voiles St Tropez the Wally organisation engaged in a consultation process with owners, project managers and designers, including Owen Clarke Design, with the goal of producing a new racer cruiser class box rule.The new class is called the Wally Cento and the rule is intended to define a maxi racer-cruiser that conforms to minimum standards of interior and fit out as outlined in the 2011 Wally rule itself. 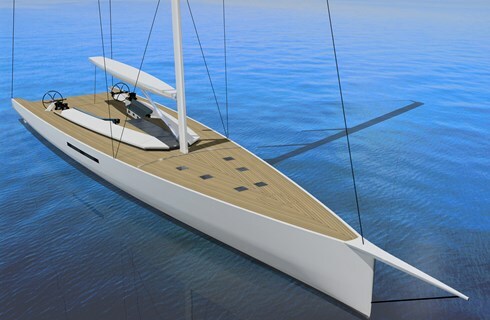 Having worked on the design of the new Cento since the rule's inception it is clear that because of her overall length and high sail area displacement ratio the Cento is a very different yacht to previous Wallys. She is very fast and this effectively draws the apparant wind to forward of the beam in almost all conditions. Although Wally are classifying her as racer-cruiser her performance potential because of her combination of waterline length and displacement are clear. Even more so when we look at the sail area to displacement ratio, which is closer to early generation R-P water-ballasted maxis like Alfa Romeo rather than Wally’s such as Indio and Tango. Owners and skippers therefore should be thinking out of the box from what has constituted Wally hull, foil and rig design in the past and looking to the future and at other classes for clues as to what is fast in a true high performance yacht. It’s all very well having a light boat with a large sail area to provide performance, but the yacht has to have the stability to match or one will be be sailing with mainsail twisted/reefed and be unable to take advantage of the power available. At the other end of the scale, a maximum beam hull will be inefficient unless its form stability is being used a large percentage of the time. 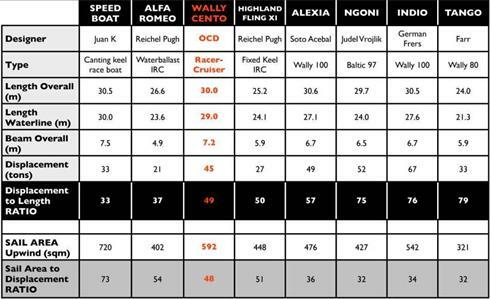 Just how will the Wally Cento’s sail since they don’t have water ballast and when will they reach maximum heel and at what wind speed? One of our Wally Cento designs has been computer modelled with the maximum sail permitted sail area and the results are shown below. In terms of performance the Wally Cento is sailing in displacement mode in the greyed out area and exceeding her hull speed elsewhere.. 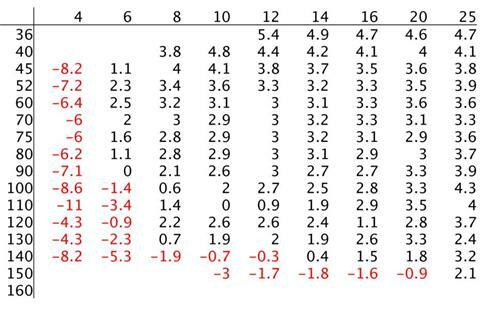 The table below illustrates just how often the apparent wind is forward of the beam, the inevitable conclusion here is that the Wally Cento is ‘hungry’ for stability even off the wind when designed with the maximum sail area and at the minimum displacement. What this also means is that because the wind is drawn forward to such an extent this stability is in use more often than heavier displacement or shorter waterline yachts – the kind of yachts the IRC rule was designed for. This is one of the reasons we believe why IRC treats lighter, more powerful designs more leniently after 60’.The stability that is penalised is effective for a higher % percentage of the time, as is the light displacement because the yachts are also effectively sailing outside their displacement mode for a greater % of the time. The performance over several different inshore courses have been evaluated in a range of conditions for two boats, one of maximum beam and one of minimum beam. For this exercise both yachts had the same sail area and displacement. 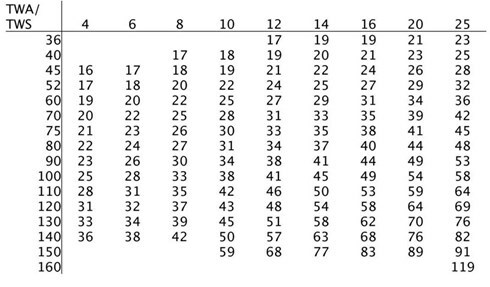 The relative speed of the two designs is illustrated in the table below where speed differences in seconds per mile are shown at a range of wind angles and wind speeds. 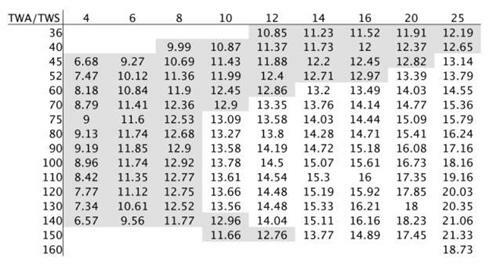 The numbers in red indicate where the wider boat is slower and the black where the wider boat is faster. It seems clear from the numbers that we have seen that the Owen Clarke Wally Cento will be an exciting, exhilarating boat to sail with performance potential well in excess of the current Wally fleet. Fully powered up in eight knots of wind even without a Code 0, the boat will have no fear of light airs and with twin rudder control fast reaching and running in higher speeds will be controllable to an extent unheard of on its single-rudder predecessors. Just as twin rudder designs were a revelation to most sailors in the first Volvo 70 VOR when the single rudder Farr designs were relegated to ‘also rans,’ the advantages of this type of yacht can be experienced when sailing as part of the Wally fleet or in other races against other IRC designs. When combined with the latest sail handling techniques, equipment and design, the sail area of the new rigs will be easier than ever to harness and control. Developments in the grand prix and short-handed racing world in terms of top down furling spinnakers and especially furling code sails/gennakers will power the yacht at the high apparent wind angles it will be sailing at most of the time. Wally have elected to place the Cento firrmly in the racing division with a speed potential far higher than their designs of the past. A fresh approach is called for to take advantage of the situation. Indeed the Cento falls squarely at the high performance end of yacht design, an area that Owen Clarke Design excel in. In partnership with Design Unlimited and KandK Superyachts we have a team that has the capabilities to produce a very special as well as a winning yacht.